Timeline Professional 2012 , Do you remember this giveaway ? I have shared this cool giveaway some months ago . I have a good news for all but especially for those who are using Timeline Professional 2012 , I found its latest version giveaway offer , so it is time to upgrade it to latest version . Respectable readers I would like to clear a misconception before proceeding furthermore . It would be Home edition , it is not its professional version . There is a some difference between both of them in terms of features and abilities . give a chance to Genie Timeline Home 2016. Genie Timeline Home is a very popular and one of the world’s best backing up softwares . Genie Timeline Home 2016 has a really easy to use interface and even an inexperienced computer/laptop user can use it easily . It can back up all kinds of file formats , images , videos , text , basic system files , PDF , Microsoft Office files etc . And there is another great feature in it that I think which is worth mentioning , it backs up new and modified files; detects changes and as well as it keeps versions to recover older or deleted files . It has both backing up abilities , manually and automatically , You just need to set the backup frequency to your preference and rest of work will do Genie Timeline Home 2016’s automatic backing up feature . Though automatic backing up feature comes with all other backing up softwares but you will feel a clear difference in it than any other backing up softwares . How ? You would have noticed in other backing up softwares , If you turned on automatic backing up feature , it disturbs you a lot while you do important work like during playing games , working with Microsoft office etc . And a big disadvantage is that Automatic backing up feature uses a big amount of system resources and your computer/laptop gets too much slow . But you will never face all these problems at all in Genie Timeline Home 2016 . Genie Timeline Home 2016 has 4 automatic backing up modes . Smart Mode , Turbo Mode , Power Saving Mode and Game Mode . Smart Mode can auto-adjust memory and CPU based on your computer/laptop usage . You can allow automatic backing up feature to run your computer/laptop’s full speed and performance with the help of its Turbo Mode . Power Saving Mode is just awesome , this feature specifically designed for laptop users . It saves battery life and this mode stops automatic backing up process when your laptop’s battery about to end . It’s Game mode pauses and prevents pop-ups while while doing very important work . You can pause and resume backing up process at any time . 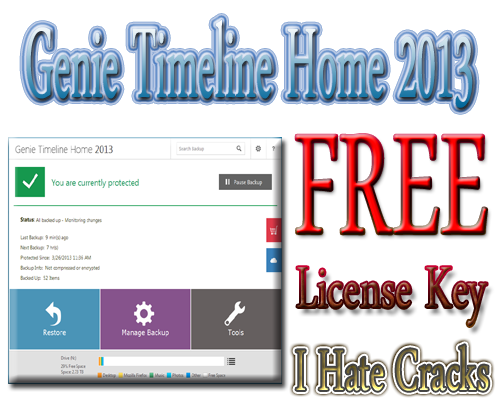 Genie Timeline Home 2016 is available at priced $39.95 per license key . But there is a giveaway going on to grab a legal license key for free . Well , by the way , I don’t know that what is its expiry date . So it is better don’t be late if you are interested . Visit the Giveaway page (Link 1 , Link 2) submit your name , a valid email address and write captcha code and click “Register” . After a few minutes you will receive its license key and download link in your mailbox .